X-TRADER trading platform is another relatively unique terminal having its advantages and its specific features, which distinguish the platform from competitors. Terminal is universal — a lot of tools in its trading arsenal allows making money in options and contracts trading. To create their product, the developers of the Trading Technologies platform have interviewed hundreds of traders, defining the main wishes of stock players. clarity of information flow during the trading session. The image of individual tool or the group of price trends is displayed in real time without time delay. Graphics X-STUDY have excellent playback quality. 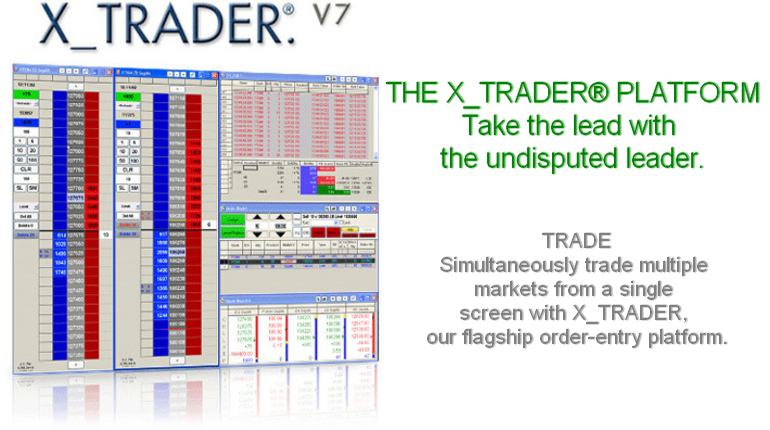 X-TRADER — Online Platform designed primarily for work in Forex, or rather, under the fast changeable market dynamics. A function of execution of QuickTrade allows you to instantly respond to the demands of the trader — the development of this function is made possible thanks to a combination of operational request and multiple liquidity providers. X-TRADER is not involved in order execution directly, but the fact of connection with Electronic Communication Network (ECN) with the platform is a positive sign. This technology suggests that the terminal is designed more for professionals than for beginners, since the program is based on ECN, it has many complex additional features, which will be dismantled only by experienced traders. However, for novice investors, there is a special add-on, or rather adaptation for beginners. When the investor first logs into the platform, he meets many tabs open at a pretty attractive interface. The color scheme of the fonts and their size allows you to quickly navigate in the numbers. For the transaction you must enter the appropriate asset and to determine the purchase or sale and the transaction amount. The trading platform has more than 50 indicators (minimum set), which can be used both singly and superposed on each other. For this the developer has provided the ability to change color scheme of one or another indicator. Use the color palette to change the color of the background, individual fields or lines, the color of the candles or their contour. ensured the safety of current transactions – transactions remain open in case of a sudden communication loss or power outage. A nice addition to the work will be with the timeline, performed in Russian. Also in the terminal there is the possibility of the transaction in a single click without the need of extra parameters is sufficient to open the position and click mouse button 1 time. Closing a position is also possible in 1 click, saving professional trader time. This function is possible through the use of Ticker “Orderticket”. There is a possibility of control of applications through the exchange of glass regardless of the current market depth. Another advantage, which we focus — display information for an open position not only in the base currency but also in points. Immediate Or Cancel — order allowing us to immediately execute an application at a fixed price or to cancel it completely if it was not satisfied. A feature of the platform is its add-ons (plugins) that extends the functionality of the terminal. The free ones are Alert Manager (one of the functions — timely notification of trading signals and any changes in the bids), “Equalizer TM”. To pay sets of automated trading programs based on spread. To sum up: X-TRADER trading platform is the ideal terminal for professionals who use short-term scalping strategy, because X-TRADER is unique in it’s speed of data transmission and processing. Through the terminal the investor gets immediate access to any financial sites, transmission schedules and quotes displayed in real time, which gives a temporary gain in comparison with a common trading ground. None of the trading platform could combine such extensive functionality (including both free and paid add-ons) that will certainly appeal to professional traders.